2 complete homes in highly sought after community on the edge of Temecula's award winning wine country. Both homes completely remodeled, panoramic views, 8 car garage spaces, private, secluded. Rare opportunity to find 2 homes on one acreage lot with all of these features. 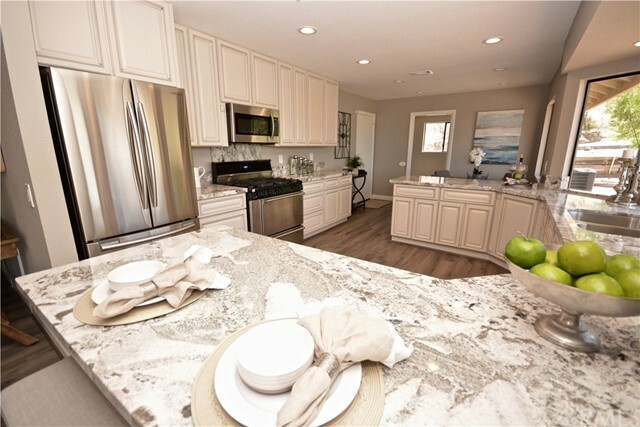 Both homes with beautiful granite kitchens. Main home is a 2616 sq foot single level with 4 bedrooms and 3 bathrooms, vaulted ceilings, fireplace, 3 car garage, sunken living room, formal entry & front porch. Home was stripped down and completely refinished with all new kitchen, new paint, new carpet and new hard-surface flooring, new bathrooms, all with granite counters. Impressive chef's kitchen open to the family room with fireplace, and has full bank of windows to take in the amazing views. Master suite with vaulted ceilings and private back yard access, and new master bath with walk in shower. Guest home is 1496 sq foot single level with full wrap-around porch to take in the panoramic valley and city light views. Large kitchen open to the spacious family room. 2 bedrooms, each with private en-suite bathrooms. Detached 5 car garage, finished and with epoxy flooring and it's own private bathroom - a great home business space or workshop! Impressive location sits on a hill, above any surrounding properties, and is located just minutes to award-winning wineries, and all the conveniences of town. With 2 homes, you can live in one and rent the other, or perfect for extended family to live just up the hill!